Knight Riders is a transport service that exceeds all expectations. We believe in combining professionalism, compassion, and efficiency to provide a positive reflection of your business to the families being served. We go above and beyond for all removals to ensure the family being served is comforted and pleased. We are pleased to offer top of the line equipment and vehicles. Knight Riders has a large fleet of vehicles that include black and white vans and four wheel drive SUVs, all of which have no markings. We understand the removal and transport is often the first interaction with the family. Therefore, we pride ourselves in providing clean, modern equipment and vehicles that show respect and competence to the families being served. Bariatric and special needs removals are no problem for Knight Riders. 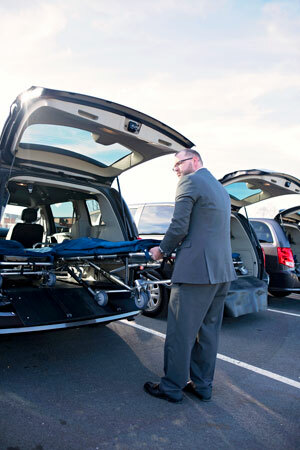 Our staff that has experience in funeral service, law enforcement, and emergency services, all of which is very valuable for all removals and especially those that require special attention. We also have a variety of special equipment for difficult locations and removals. Knight Riders will go anywhere needed for long distance transports. Our staff is familiar with funeral home to funeral home transports, as well as long distance facility removals and transports. We also provide convenient payment methods that include on-site payment. Our answering services staff are very polite, professional, and qualified. They understand the funeral industry, vocabulary that is specific to the industry, and most importantly the compassion needed when speaking with families. The staff will always document conversations and make sure all messages are thorough and complete. Our goal is to support you and your staff, while representing your firm in the same manner as your employees. We will specify our services to match your firm and image. Our staff will be trained to handle all questions and concerns, as well as first calls, in the manner in which you suggest. We want to be a reflection of your service, while providing support to our staff.